Dam Hotel, Amsterdam discount hotels and accommodation. 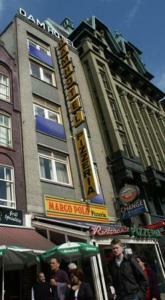 The Dam Hotel is centrally located near the Central Station and Dam Square. Our rooms are furnished with modern furniture and each room has a washbasin, shower, toilet and cable TV. A tasty breakfast is served from 8 - 10.30 am. You can also lunch or dine in style at our Marco Polo restaurant. Furthermore, our Lorentz' exchange office offers you the best exchange rates in town. View photos, room descriptions and make online reservations at Dam Hotel. Save on room prices at Dam Hotel, Amsterdam.